It's come to this. All the confusion and chaos and change and turmoil in our working lives have finally tipped the balance. We now need a new way of doing business. Most of us view change as a threat, and survival as the goal. Yet we work too hard to consider just getting by as our primary goal. 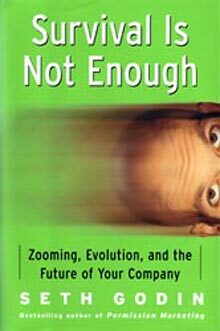 In "Survival Is Not Enough," best selling author Seth Godin provides a groundbreaking new way to organize companies to thrive during times of change. It contains a simple yet revolutionary idea: We can evolve our companies the same way nature evolves a species.